So, I went to the Fringe last weekend. 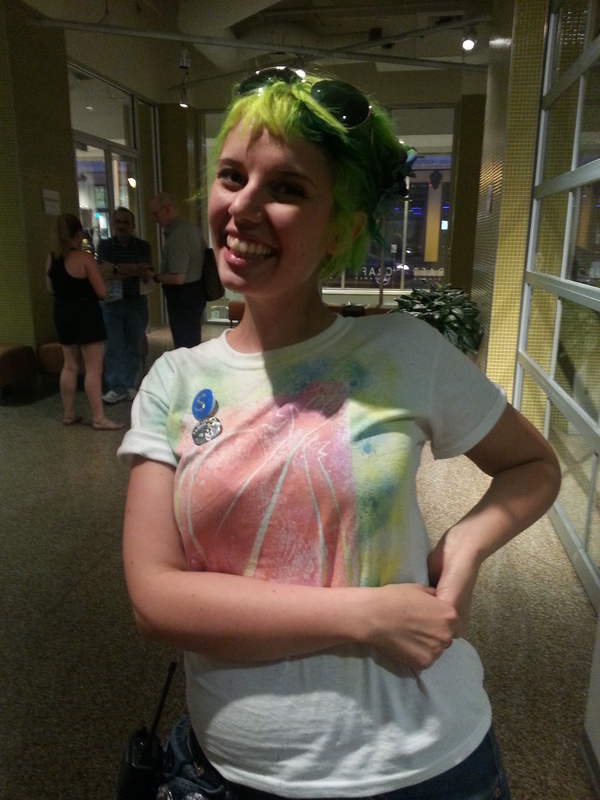 The St. Lou Fringe, that is. It’s the biggest theatre festival in St. Louis, having just finished its second year under the direction of Executive Director Em Piro and a large crew of staff and volunteers, involving many local theatre companies and some from around the country, as well as dance, live music, after parties, family activities and more. There was a lot going on in Midtown, but I only managed to see a small portion of it. One of the thoughts I had after attending was that I wish it were bigger, and with all the creative energy and enthusiasm of all involved I’m sure it eventually will be. Still, for an event only two years into its life, it’s an impressive venture, with many different acts on a schedule spread out over four days in Midtown. This production was the least polished of the shows I saw at the Fringe. The title is descriptive, as there was very little sense and a lot of rapid-fire jokes, some landing and some not. That’s part of the nature of experimental theatre, though, and there were some interesting, funny things going on here. The cast, led by co-author Joey Puricelli as Skitz O. Frenic, whose house and mind are the setting for the action, made a good effort and displayed a strong sense of enthusiasm, even though some volume and enunciation issues occasionally made some of the dialogue unintelligible (and this doesn’t count the intentional gibberish that is part of the performance). I especially liked the use of music in the scene breaks. Overall, it was an interesting performance with a plot that’s difficult to describe, but performed by an enthusiastic ensemble. This performance, a one-man show performed by actor O’Brien with more energy than I could have imagined, was a delight from start to finish. Well-written, perfectly paced, impeccably researched and organized, the production tells the story of as a socially awkward, Dutch librarian who undertakes a life-changing quest when he becomes obsessed with finding the person who turned in an extremely (100+ years) overdue library book. This remarkable play made excellent use of slides from around the world and recorded music to establish the mood and tone of the story. Issues of relationship, love, religion and regret are dealt with along this fascinating journey, and I continue to be amazed at the sheer range of O’Brien’s remarkable performance. This was a real treat. I walked into the space for this performance as “ABC” by the Jackson 5 played over the sound system, in a bouncy instrumental version deliberately arranged to sound like it came from an 8-bit video game console. The 8-bit video game-style music enhanced the performance and included various popular songs from Lady Gaga and others. 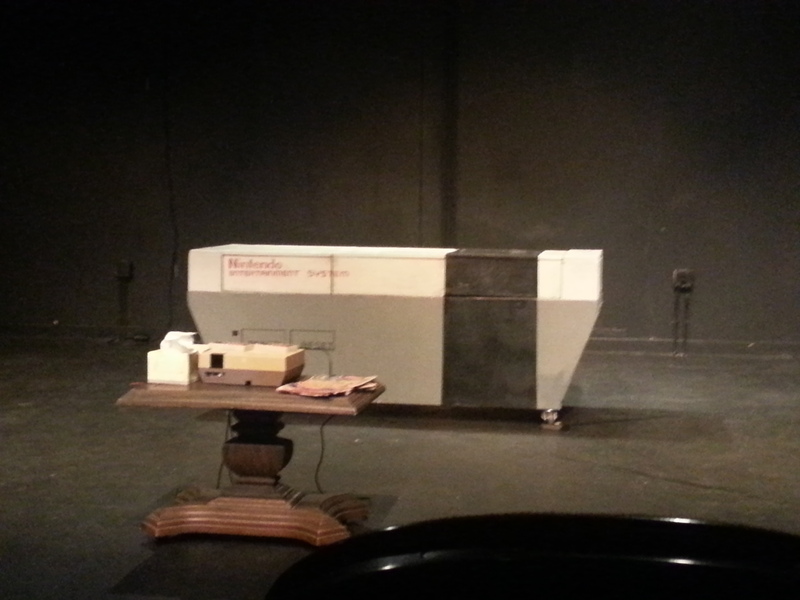 There was a clever set that resembled a giant Nintendo system that folded out to serve alternately as a couch, two chairs and a bed. This production told a compelling story that follows two childhood friends identified only as Player 1 (Charles Azkenaizer) and Player 2 (Gannon Reedy), who bond over video games, and Super Mario Bros. in particular. The play follows the two players as they grow up, attend college, and encounter the various challenges of adult life, all the while constantly re-visiting their video game addiction while dealing life issues including religion, romance, jealousy, parenthood, responsibility and mortality. The performances were thoroughly believable and both actors displayed a genuine sense of friendship throughout the challenges presented in the show. This was a truly heartwarming production that featured moments of real humor as well as some intense drama. Hilarious, spot-on send-up of theatrical conventions, as three actors (Casey Boland, Beth Wickenhauser and Kirsten Wylder) put on an intentionally incomprehensible, derivative play about love, loss and lettuce while narrating their thoughts as actors. This truly hilarious production has a lot of appeal for theatre geeks like me, with its references to the dynamics of the actors’ relationships to each other, the creatives and the material itself, with mentions of such varied figures in performing arts as Tennessee Williams, Uta Hagen and Robert Pattinson. The production is spot-on in dealing with issues of differing acting styles, image and ego, technique, popularity, technical details and all aspects of producing a play. This was a delightful production with excellent comic work from all three players, and anyone who has ever been in a play would especially be able to relate. This thought-provoking, funny, engaging piece about a young girl’s struggles to make sense of modern society made clever use of various interactive elements (props handed out, texting) to enhance the performance and add to the overall atmosphere. It follows the story of Mea (Sofia Murillo), a teenage girl who feels outcast from society, on her quest to understand her world and figure out which path to follow and who to listen to. 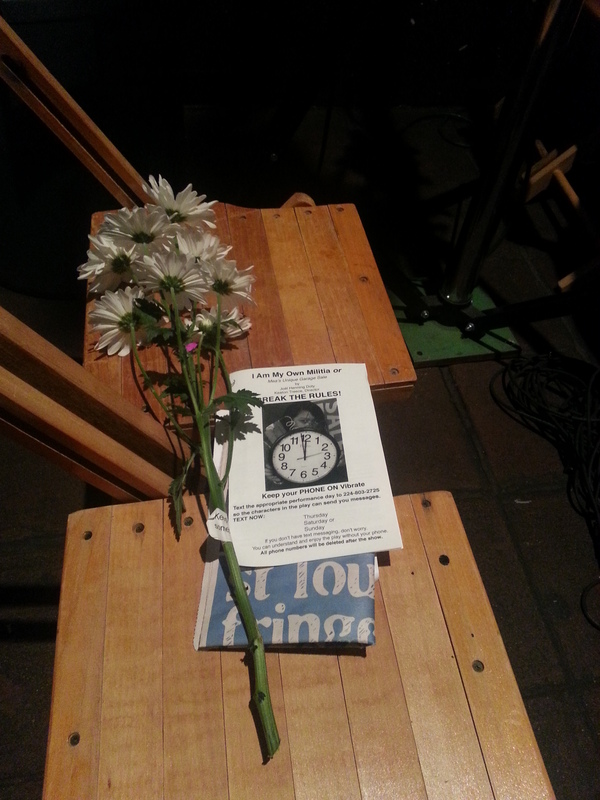 Audience members with cell phones were further immersed in the story through the use of text messages sent during the show, ostensibly from characters in the play. These texts in particular helped advance the story in a compelling way. Slowly, the various characters act as influences on Mea’s life, the plot develops and you eventually see what’s going on. It was fascinating to watch and ultimately very moving, with strong performances all around, especially by Murillo, who held the stage admirably, portraying all the character’s conflicting emotions and loneliness, as well as her strong personality, and made the audience genuinely care about her situation. It felt like a fully integrated 21st century presentation, and I was honored to experience it. Overall, I would say the Fringe is more than an enjoyable weekend, and even the word “success” seems inadequate. It’s more than a success. It’s a living, growing, vibrant work-in-progress that celebrates not only the arts, but the revitalization of Midtown St. Louis as well. I look forward to seeing what’s in store for next year. 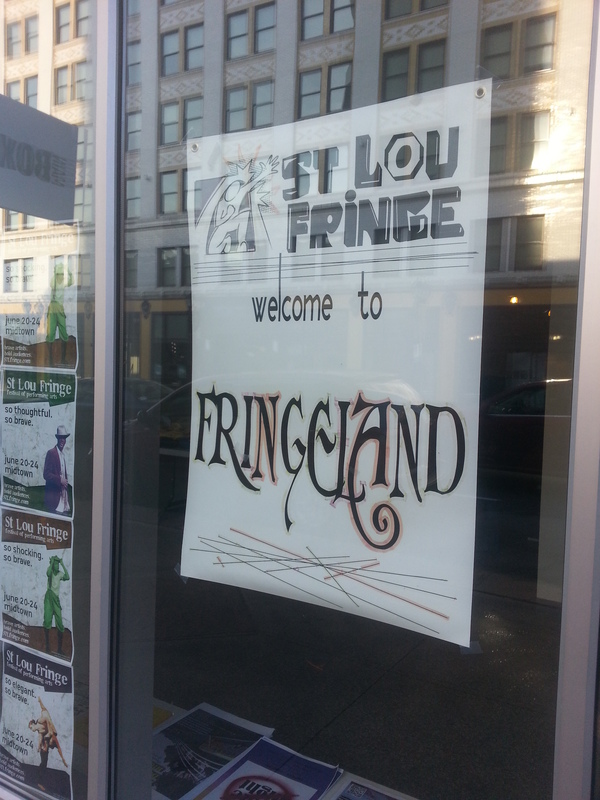 For more information about St. Lou Fringe, check out the link to their website in the sidebar of this blog.